Find The Best Baby Bath Tubs For Your Little Angel. Since the day you found out about your baby, you have been dreaming. Dreaming of singing him lullabies, dreaming of him sleeping snug in your arms, dreaming of breathing in his lovely baby scent. You have imagined him giggling and gurgling as you tickle his soft feet. Of course, you know that they scream and cry for just about everything, but that's just background noise for you right now. Knowing you are in for long nights and unexplainable loud crying is not the same as experiencing it. "Why is my baby Suddenly screaming in the bath?" While I cannot claim to understand baby lingo, I can offer you some time-tested and parent-approved tips and tricks that will help your screaming baby start enjoying his bath. Give your exhausted self a little respite and start Making Happy Bath Time Memories with your little one. This FREE 'Tips and Tricks List' will be sent to you as soon as you Opt In here. What makes this tub so much better than the hundreds of baby bath tubs out there in the market? It answers most of your underlying reasons why your baby might be screaming during bath time. It has a soft mesh for newborns and a sweet 'baby stopper' insert to prevent your baby from slipping. It is easy to drain and clean. You can hang it up to dry which saves space and prevents mold for building up. The green seat is hard to pull out. The drain sits plush with the tub floor, so water won't drain unless you lift the tub. Works well in kitchen sink though. Overall the Fisher Price 4-in-1 Sling n Seat Tub has received 4.5 star ratings from parents and is definitely a Bestseller on Amazon. "Finally, the perfect tub for my baby. I originally purchased The First Years, Sure Comfort Tub and absolutely hated it. My newborn daughter was constantly slipping down into the water and the tub also pressed into her back, marking her up. I finally purchased this when she was about 3 months old. I should have done it much, much sooner. This tub is amazing. I have been using it for almost 5 months now." A smiling baby enjoying his bath time. Is that for real? According to the thousands of parents who have bought this gorgeous bath tub, yes!! Made of plush polyester it is a happy change from traditional plastic tubs. The petals can be rearranged to support your baby's head. Is flexible and can easily fit your kitchen sink. If your sink is too wide, follow one parent's advice who sits the Blooming Bath into a plastic beverage tub! Be creative. It is foldable making it easy to carry during travels. Machine wash it on a gentle cycle and throw in dryer for 10-15 minutes for a quick clean up. When he outgrows the sink bath, use it in the baby bath tub as a soft cushion for him to sit on. 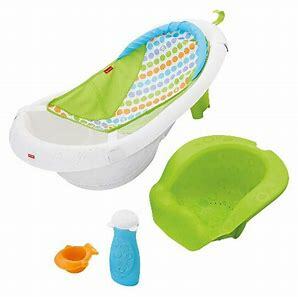 Very supportive and comfortable for your baby. Makes for great photo shoot ops! If your sink is too big or too small, the petals might not sit the way they should. You could follow the advice given above and get a plastic tub to sit it in. Draining out the water is too much work for some parents. For some parents, the cushion ripped. Can develop mold if it is not properly washed and dried. Overall, the Blooming Bath has received a 4.5 star rating from over 1000 parents. 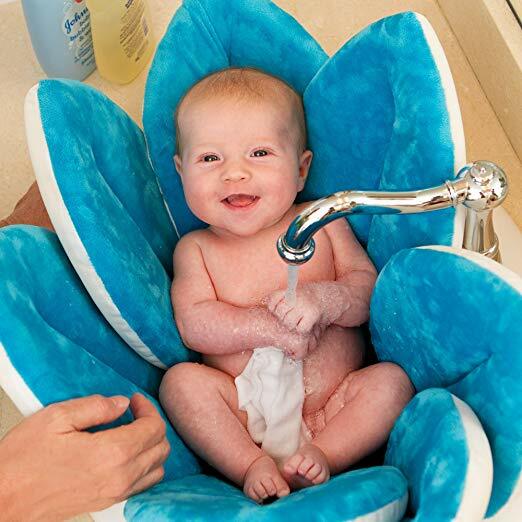 "I purchased this as a gift for a preemie mom whose child screamed all through bath time. By his second bath, he was happy as could be and that is now a peaceful time for the whole family!" And there you have it. Our top picks for the best baby bath tubs for 2019. Not only are they great buys for your own baby, but they make amazing gifts for friends and family who are expecting their own little bundle of joy. So go ahead and spread the love. Have you tried one or the other of these. Which one do you think would work best for your baby? Or perhaps you have had great success with another. Write to us in the comments below or join the conversation on our Facebook page, Decorating 4 Kids. We would love to hear from you.